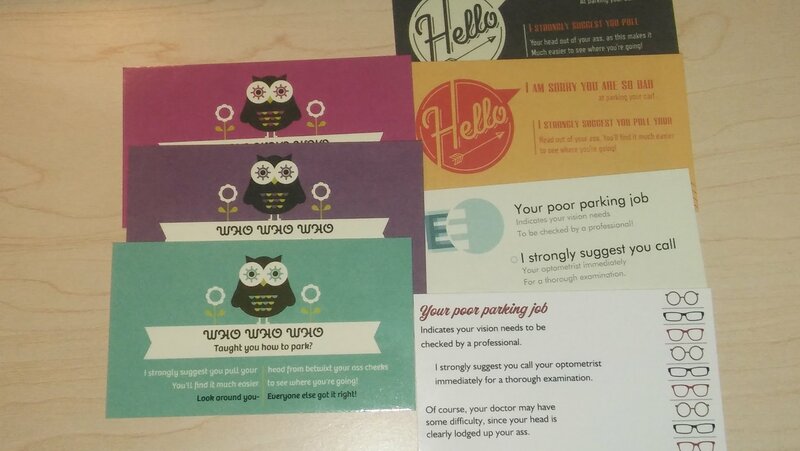 These easy-to-carry cards will let those with poor parking skills know just how you feel. Whether they've parked crooked, taken up 2 or more spaces, parked so close to the line that you can't even get in your car, slip one of these cards under their wiper or in the window seal to express your displeasure. 3 each of 7 different cards per pack. Each card also has a reverse side, some with check boxes to specify the parking infraction. Now including 4 bonus "You have the right to be stupid" cards. Good for so many occasions! Pack comes in a pretty card-stock envelope to keep organized in your glove box or purse. Bloomin' Pens - dozen "factory seconds"